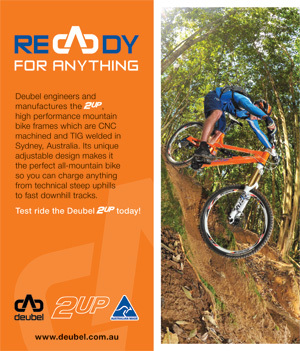 AMB Magazine - "DEUBEL TROUBLE"
Racing at Thredbo was Matthew Harrington who came in 10th Place in Elite's. Also racing this weekend was Pat Butler for the State Downhill Championships coming in 2nd Place in Under 15's. Racing for the National Champs was David Maggs in Under 19's who came 11th and Pat Butler in Under 15's taking 3rd Place. The first round of the Australian Gravity Enduro was held at Glenworth Valley. Representing the Deubel Racing racing team was Matthew Harrington in Elite who came 10th, Richard Napper in Elite who came 14th and Mathieu Taris who came 2nd in Veterans. See the Deubel 2UP in 360!